Happy December 1st! Seriously, something about this year... it really has flown by, amiright?! I'm sure you have been following along with your favorite bloggers this past week for gift ideas for everyone on your list (Chris Loves Julia always curates great gift guides). Thoughtful gifts are so fun for me to give and receive, but my favorite thing to open on Christmas morning are STOCKINGS! I just picked up these new stockings and these stocking holders. They look so cute on the mantle! Growing up, my Mom (I mean, Santa) always surprised my sister and I with the BEST stockings! My whole life, I have told my Mom that I would totally forego presents and be happy as a clam with only a stocking on Christmas morning. Now, for an 8 year old to say that, you know that the stocking stuffers that Mom curated were pretty awesome. Not expensive, just really fun, thoughtful, practical and creative. Mom would wrap every little item (yes, even Chapstick) so that it would take us longer to enjoy what she filled inside our stockings. 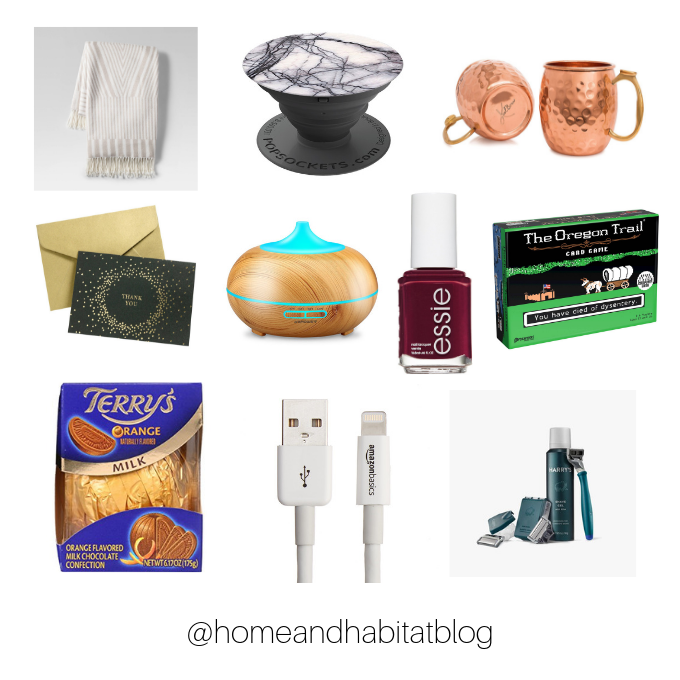 In the spirit of Mom's winning stockings, I have complied 30 stocking stuffer ideas for you into one gift guide since so many of these gifts can cross-over to him or her. Scroll down for the links to shop the list! 3. Target Dollar Spot. Great place to look for little toys, candles, gloves, etc. 16. 6-ft long phone charger. Because the 3-ft ones just don't reach any convenient outlet. Ever.